ITO ANG GUSTO KO! ALAN CAYETANO! While Alan was stuck in Manila attending to his COMELEC case to have Joselito “Peter” Cayetano disqualified as a nuisance candidate, I did my only little thing campaigning for him across the country (as of posting, Comelec has not yet disqualified the nuisance candidate which means his name is still in the ballots and as reflected in the past surveys is causing Alan’s rating to drop from 7-12%). 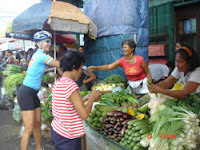 We headed north and biked throughout the provinces of La Union, Ilocos Sur and Ilocos Norte. Biking with me were my brother Lino, national triathlon champ, George Vilog and Patrick Joson of Kape ni Juan and Yabang Pinoy. We also did market stops along the way. One of the highlights of the trip was seeing a vegetable vendor, Aling Nellie in a market in San Fernando, La Union, wearing dad’s shirt. Imagine how I felt! I wanted to hug her… which I did. 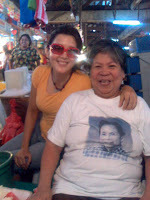 Promised to send her Alan’s campaign shirt and one of my Pinay In Action shirts. We slept in beautiful historic Vigan that night. The next day we took in the sights and food, walked along the cobble stone road and ate good ol’ dirty ice cream. That’s Lino and my kids, Maxie and Nadine. Next day we moved on to Laoag and then Pagudpud. As the sun started to set, I went for a run heading eastward, running through the breathtakingly beautiful golden rice fields and then up the mountains towards Cagayan. 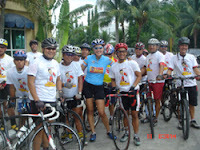 supporters, organized by former national triathlete and long distance triathlon champ, Nonoy Jopson, who rode with me around Cebu campaigning for Alan. We did the same thing in parts of Batangas, Cavite and Tagaytay. I have to admit, biking is my favorite way of campaigning! 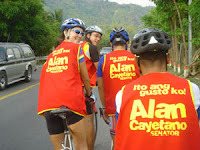 Before I go, a friendly reminder.. para mabilang ang inyong boto, isulat ALAN CAYETANO!. Met your brother Alan at Subic where he was guest speaker at a Mathematics Training Program for kids. Of course, also voted for him! And am glad he is beating the odds despite that nuisance guy…. A big CONGRATULATIONS to Sen. Alan Peter Cayetano!!!!! Congratulations Alan. Reminder lang. This is trully a miracle. INC and EL Shaddai dumped him but still won. It just shows who is really in control of our lives. Esther 4:4 At such a time as this..